This article is about the region of Italy. For the football club, see S.S. Lazio. For other uses, see Lazio (disambiguation). Lazio (UK: /ˈlætsioʊ/, US: /ˈlɑːtsioʊ/; Italian: [ˈlattsjo]; Latin: Latium) is one of the 20 administrative regions of Italy. Situated in the central peninsular section of the country, it has almost 5.9 million inhabitants – making it the second most populated region of Italy (after Lombardy and just a little ahead of Campania)  – and its GDP of more than 170 billion euros per annum means that it has the nation's second largest regional economy. The capital of Lazio is Rome, which is also Italy's capital and the country's largest city. Panorama of the Aniene Valley. 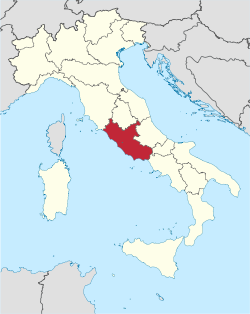 Lazio comprises a land area of 17,242 km2 (6,657 sq mi) and it has borders with Tuscany, Umbria, and Marche to the north, Abruzzo and Molise to the east, Campania to the south, and the Tyrrhenian Sea to the west. The region is mainly flat, with small mountainous areas in the most eastern and southern districts. The coast of Lazio is mainly composed of sandy beaches, punctuated by the headlands of Circeo (541 m) and Gaeta (171 m). The Pontine Islands, which are part of Lazio, lie opposite the southern coast. Behind the coastal strip, to the north, lies the Maremma Laziale (the continuation of Tuscan Maremma), a coastal plain interrupted at Civitavecchia by the Tolfa Mountains (616 m). The central section of the region is occupied by the Roman Campagna, a vast alluvial plain surrounding the city of Rome, with an area of approximately 2,100 km2 (811 sq mi). The southern districts are characterized by the flatlands of Agro Pontino, a once swampy and malarial area, that was reclaimed over the centuries. 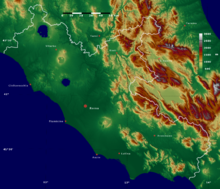 The Preapennines of Latium, marked by the Tiber valley and the Liri with the Sacco tributary, include on the right of the Tiber, three groups of mountains of volcanic origin: the Volsini, Cimini and Sabatini, whose largest former craters are occupied by the Bolsena, Vico and Bracciano lakes. To the south of the Tiber, other mountain groups form part of the Preapennines: the Alban Hills, also of volcanic origin, and the calcareous Lepini, Ausoni and Aurunci Mountains. The Apennines of Latium are a continuation of the Apennines of Abruzzo: the Reatini Mountains with Terminillo (2,213 m), Mounts Sabini, Prenestini, Simbruini and Ernici which continue east of the Liri into the Mainarde Mountains. The highest peak is Mount Gorzano (2,458 m) on the border with Abruzzo. For the history of ancient Lazio, see Latium. The Appian Way (Via Appia), a road connecting Ancient Rome to the southern parts of Italy, remains usable even today. The Italian word Lazio descends from the Latin word Latium. The name of the region also survives in the tribal designation of the ancient population of Latins, Latini in the Latin language spoken by them and passed on to the city-state of Ancient Rome. Although the demography of ancient Rome was multi-ethnic, including, for example, Etruscans and other Italics besides the Latini, the latter were the dominant constituent. In Roman mythology, the tribe of the Latini took their name from king Latinus. Apart from the mythical derivation of Lazio given by the ancients as the place where Saturn, ruler of the golden age in Latium, hid (latuisset) from Jupiter there, a major modern etymology is that Lazio comes from the Latin word "latus", meaning "wide", expressing the idea of "flat land" meaning the Roman Campagna. Much of Lazio is in fact flat or rolling. The lands originally inhabited by the Latini were extended into the territories of the Samnites, the Marsi, the Hernici, the Aequi, the Aurunci and the Volsci, all surrounding Italic tribes. This larger territory was still called Latium, but it was divided into Latium adiectum or Latium Novum, the added lands or New Latium, and Latium Vetus, or Old Latium, the older, smaller region. The northern border of Lazio was the Tiber river, which divided it from Etruria. The emperor Augustus officially united almost all of present-day Italy into a single geo-political entity, Italia, dividing it into eleven regions. The part of today's Lazio south of the Tiber river – together with the present region of Campania immediately to the southeast of Lazio and the seat of Neapolis – became Region I (Latium et Campania), while modern Upper Lazio became part of Regio VII - Etruria, and today's Province of Rieti joined Regio IV - Samnium. After the Gothic conquest of Italy at the end of the fifth century, modern Lazio became part of the Ostrogothic Kingdom, but after the Gothic War between 535 and 554 and the Byzantine conquest, this region regained its freedom, because the "Roman Duchy" became the property of the Eastern Emperor. However, the long wars against the Longobards weakened the region. With the Donation of Sutri in 728, the Bishop of Rome acquired the first territory in the region beyond the Duchy of Rome. The strengthening of the religious and ecclesiastical aristocracy led to continuous power struggles between secular lords (Baroni) and the Pope until the middle of the 16th century. Innocent III tried to strengthen his own territorial power, wishing to assert his authority in the provincial administrations of Tuscia, Campagna and Marittima through the Church's representatives, in order to reduce the power of the Colonna family. Other popes tried to do the same. During the period when the papacy resided in Avignon, France (1309–1377), the feudal lords' power increased due to the absence of the Pope from Rome. Small communes, and Rome above all, opposed the lords' increasing power, and with Cola di Rienzo, they tried to present themselves as antagonists of the ecclesiastical power. However, between 1353 and 1367, the papacy regained control of Lazio and the rest of the Papal States. 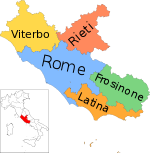 From the middle of the 16th century, the papacy politically unified Lazio with the Papal States, so that these territories became provincial administrations of St. Peter's estate; governors in Viterbo, in Marittima and Campagna, and in Frosinone administered them for the papacy. Lazio comprised the short-lived Roman Republic, in which it became a puppet state of the First French Republic under the forces of Napoleon Bonaparte. The Republic existed from 15 February 1798 until Lazio was returned to the Papal States in October 1799. In 1809, Lazio was annexed to the French Empire under the name of Department of Tibre, but returned under the Pope in 1815. In 1927 the territory of the Province of Rieti, belonging to Umbria and Abruzzo, joined Lazio. Towns in Lazio were devastated by the 2016 Central Italy earthquake which occurred on 24 August 2016. Industrial development in Lazio is limited to the areas south of Rome. Communications and - above all - the setting of the border of the Cassa del Mezzogiorno some kilometers south of Rome, have influenced the position of industry, favouring the areas with the best links to Rome and those near the Autostrada del Sole (motorway), especially around Frosinone. Firms are often small to medium in size and operate in the building and building materials (Rome, Civitavecchia), paper (Sora, Italy, Isola del Liri), petrochemical (Gaeta, Rome), textile (Frosinone), engineering (Rieti, Anagni), automobile (Cassino), electronic and electrotechnical (Viterbo) sectors. Approximately 73% of the working population are employed in the services sector; this is a considerable proportion, but is justified by the presence of Rome, which is the core of public administration, banking, tourism, insurance and other sectors. Many national and multinational corporations, public and private, have their headquarters in Rome (ENI, Enel, Leonardo, Alitalia, RAI). Lazio's limited industrial sector and highly developed service industries allowed the region to well outperform the Italian economy in 2009 in the heart of the global financial crisis. The unemployment rate stood at 10.7% in 2017. With a population of about 5.887 million, Lazio was at the end of 2014 the second most populated region of Italy. The overall population density in the region is 341 inhabitants per km2. However, the population density widely ranges from almost 800 inhabitants per km2 in the highly urbanized Province of Rome to less than 60 inhabitants per km2 in the mountainous and rural Province of Rieti. As of January 2010, the Italian national institute of statistics ISTAT estimated that 497,940 foreign-born immigrants live in Lazio, equal to 8.8% of the total regional population. Rome is center-left politically oriented by tradition, while the rest of Lazio is center-right oriented. In the 2008 general election, Lazio gave 44.2% of its vote to the centre-right coalition, while the centre-left block took 41.4% of vote. In the 2013 general election, Lazio gave 40.7% of its vote to the center-left block coalition, 29.3% to the center-right coalition and 20.2 to the Five Star Movement. ^ a b c "Bilancio demografico Anno 2017 (dati provvisori)". demo.istat.it. ^ Jacobs, Frank. "Bigger Than You Think: the Vatican and its Annexes". Big Think. Retrieved 2018-06-25. ^ Powerful Earthquakes in Italy. ^ "Foreign-born population in Italy, 1 January 2010" (PDF). Istat. Retrieved 13 September 2011. Wikimedia Commons has media related to Lazio. This page was last edited on 13 April 2019, at 10:33 (UTC).